If you are the OnePlus 3 user and want to test the latest Android 7.0 Nougat on your phone. Then you might be excited to hear that an unofficial CyanogenMod ROM (CM14) based on Android 7.0 is available for download. 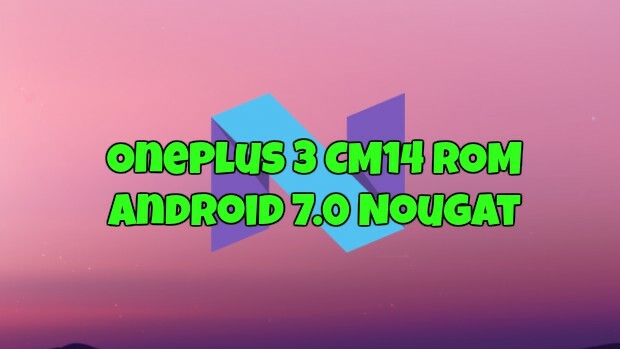 The ROM is still in beta stage and has som minor bugs, but most of the users who already installed the CM14 on their phone are happy with the performance of this new OnePlus 3 CM14 ROM. The main issue most of the user are facing with this ROM is a camera, sometimes the camera, is not working properly and rest of that everything is working fine. CM14 Android 7.0 is in the testing stage right now, and most of the driver already received the Unofficial CM 14 ROM. Here you can check the list of the device which are running on the Android 7.0 custom ROMs. Today in this guide we will discuss how to install OnePlus 3 CM14 ROM. Below is the guide which yu can follow on your phone and update the same with CM 14. Read all the instruction carefully and do take the full backup of your phone. Warning: Technobuzz.net is not responsible for any damage that might happen to your phone during this process. The guide is only for the Oneplus 3 users and don’t try this method on any other oneplus phone. To get started you need a phone with TWRP recovery (Read Here How to Install TWRP on Oneplus 3) and Two zip file to flash on the phone. So without wasting your time lets starred and install this new ROM. All you have to download this zip file on your phone and flash the same with the help of TWRP custom Recovery. You need to flash this file after the CM 14 ROM to install all the latest Google Applications on your phone. Download the zip file save the file on your phone. Make your you download ARM 64 version Gapps Zip file. 1. Once ROM zip file and Gapps Zip file are saved on your phone. Boot your phone in TWRP recovery mode. To do this Press and hold “Volume Down+Power Button”. 2. [OPTIONAL] Take the Nandroid backup of your system, If something goes wrong then you can quickly restore the previous system on your phone. To do this Tap on Backup and take the backup of your system. 3. Now Go to Wipe > Select Dalvik, Cache, Data and System and Swipe to Wipe. 5. Once the ROM is successfully flashed, You need to install the Google Application. Go back and flash the Gapps zip file. 6. Now wipe cache & Dalvik cache again and Reboot your device. Now your phone will reboot, and the first boot will take some time near about 10 to 12 minutes to make some changes on your phone. Now your Oneplus 3 phone is running on the CM14 Android 7.0 Unofficial Custom ROM. Let us know if you have any questions via comments below.